Rapidly isolate high molecular weight DNA using AMRESCO’s Yeast Genomic DNA Purification Kit that utilizes a non-enzymatic lysis buffer and is free of phenol, glass beads and capacity restrictive columns. 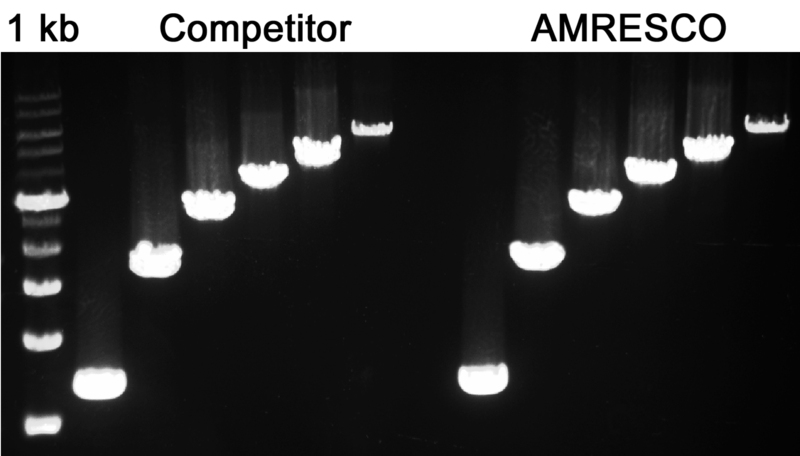 AMRESCO’s Yeast Genomic DNA Purification yields more DNA than a competing kit. Image courtesy of Dr. Anton Komar, Center for Gene Regulation in Health and Disease, Cleveland State University. AMRESCO’s Yeast Genomic DNA Purification Kit samples were observed to have greater signal intensity than the competing kit’s samples due to higher DNA yield. The sturdy yeast cell wall is a formidable barrier to the extraction of this model organism’s cellular contents, including its genomic DNA. Conventional methods for breaching the cell wall and isolating DNA are both time- and labor-intensive, may require hazardous reagents, and are rigorous enough to damage the extracted DNA. AMRESCO now offers an easier and faster alternative method with the new Yeast Genomic DNA Purification Kit, which yields high quality, high molecular weight DNA in under an hour. AMRESCO’s Yeast Genomic DNA Purification Kit utilizes a proprietary, non-enzymatic lysis buffer in a simple protocol that may be scaled for large or small samples. The four-component kit is compatible with both liquid cultures and colonies, with performance optimized for Saccharomyces cerevisiae, although other fungi may also be used. The purification process begins with lysis of the yeast cell wall using the proprietary lysis solution plus optional, simultaneous RNase A treatment, and is followed by protein precipitation and subsequent DNA precipitation. Unlike many conventional yeast genomic DNA purification methods, AMRESCO’s kit does not use expensive enzymes, messy glass beads, hazardous phenol and chloroform, or capacity restrictive columns. The only pieces of equipment required are a centrifuge and a heated water bath. The Yeast Genomic DNA Purification Kit is ideal for rapid and consistent purification using gentler treatment of cells to preserve genomic DNA integrity. AMRESCO’s highly accurate Fluorescent DNA Quantitation Kit indicates that an average yield of 1.5 µg DNA per 5 x 10e7 Saccharomyces cerevisiae is extracted with the Yeast Genomic DNA Purification Kit. The high quality DNA is compatible with downstream applications, such as, PCR, restriction enzyme digestions and Southern blotting. For more information about the Yeast Genomic DNA Purification Kit or any other AMRESCO product, visit http://www.amresco-inc.com or call 1-800-448-4442. AMRESCO is a manufacturer and supplier of high quality biochemicals and reagents for molecular biology, life sciences, proteomics, histology and clinical areas of research. The company is ISO certified to ensure customers receive the highest quality products. 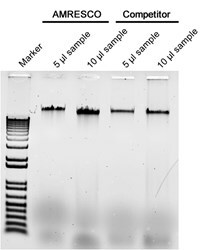 PCR amplification using yeast genomic DNA templatesEqual volumes of genomic DNA purified from 5 x 10e7 Saccharomyces cerevisiae were used as templates in six different PCR reactions designed to produce amplicons from 718 bp to 5,290 bp in length.